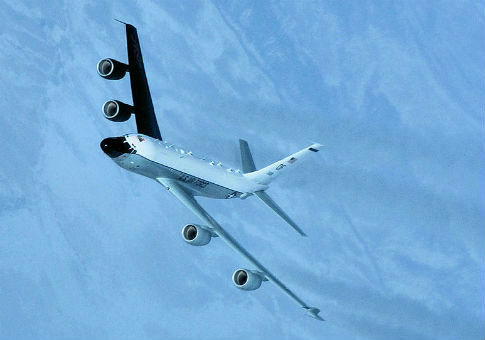 A Russian Su-27 jet fighter came within 20 feet of a U.S. RC-135 reconnaissance aircraft over the Black Sea on Monday in Moscow’s latest military provocation involving dangerous aerial encounters. "On Jan. 25 an RC-135 aircraft flying a routine route in international airspace over the Black Sea was intercepted by a Russian Su-27 in an unsafe and unprofessional manner," Navy Capt. Daniel Hernandez, chief spokesman for the U.S. European Command, told the Washington Free Beacon. "We are looking into the issue." The thrust from the Su-27 "disturbed the controllability" of the RC-135, said one official familiar with details of the incident. The areas of discussion included air safety over the skies in Syria as well as "the means to avoid accidents and unintended confrontation between coalition and Russian forces whenever the two sides operate in close proximity," Pentagon spokesman Peter Cook said in a statement. The provocations are not limited to U.S. forces. On Tuesday, Japan’s Defense Ministry revealed that Japanese interceptor jets were scrambled to chase two Russian Tu-95 Bear bombers that approached the northern end of Japan and flew just outside that country’s airspace in maneuvers described by analysts as unusually close. And last July 4, two Tu-95 nuclear-capable bombers flew within 40 miles of the California coast and communicated a "happy birthday" message to intercepting U.S. pilots. That incident took place the same day President Obama held a telephone conference with Russian leader Vladimir Putin. Russian Tu-95 bombers also circumnavigated Guam in December, for the second time in two months. Guam is the U.S. military's major hub and a key facility in the American military rebalance to Asia. "Much of what Russia is doing today is aimed at generating fear of Russian military power and the possibility of war," said former Pentagon Russia expert Mark Schneider. "That is broadcast on a daily basis in the state media and through Russian military actions," Schneider added. "Provocations involving aircraft are now common place. Russia also tends to be paranoid concerning foreign espionage and the protection of state secrets." Adm. Cecil Haney, commander of the U.S. Strategic Command said Russian military activities, including aircraft flights, are an increasing concern as Moscow seeks to reemerge as a world power. Russian military aircraft have been conducting flights in Europe without the use of air-traffic control tracking transponders, a practice Haney called "reckless." "At the foundation of the negative development of the international situation lie the USA's actions, which in striving for global hegemony intentionally forms global instability to weaken strategic opponents, primarily Russia, creating national security threats to our country," Chvarkov said, according to the state-run RIA Novosti news agency. Western policies are fomenting global and internal conflicts that have produced the flood of refugees in Europe, Chvarkov said. He added that the West is waging "information war" on Russia. This entry was posted in National Security and tagged Air Force, Russia. Bookmark the permalink.